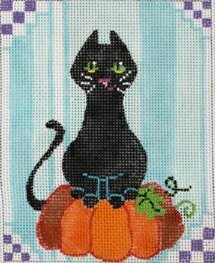 This Tall Cat on Pumpkin Halloween needlepoint design is handpainted onto 18 mesh Mono Zweigart needlepoint canvas. The design area measures 4" x 5". If you need stretcher bars we recommend a set of 8" and a set of 9" bars and some thumb tacks.